We’re very happy to have The Scuba Shop as a sponsor for Endemic Animal Festival 2017! Founded in 1993, The Scuba Shop is conveniently located in Simpson Bay. They are the largest dive store in the Windward and Leeward islands and an long-time supporter of Les Fruits de Mer and the Endemic Animal Festival. Swing by for scuba or snorkeling gear, or to pick up their free snorkeling guide. 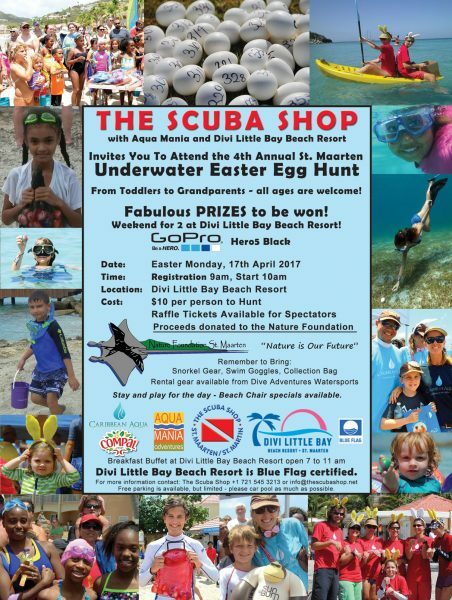 Also, the annual Underwater Easter Egg Hunt is coming up soon! Mark your calendars for Monday, April 17th!